Four short films on long prison sentences. Quick views on our slow justice system. Rock Ed Film project group: Tado Jimenez, Lourd de Veyra and Marj Lachica, Pepe Diokno, Gang Badoy and Kidlat de Guia tell you through film what they learned about Phil jails and about justice Philippine-style. 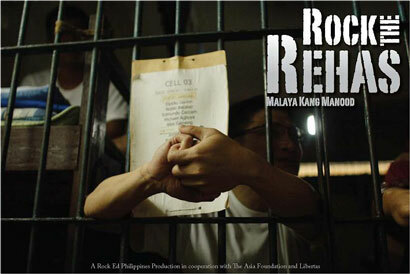 This film gave birth to a series of projects that support inmates and their rights and safety. We have a gig on the 31st of August at the Eastwood Main Plaza to launch this project. ROCK THE REHAS featuring Radioactive Sago Project, Jeepney Joyride, Kala, Rocksteddy, Fig, Peryodiko and Gasulina. Please donate used or new T-shirts for inmates of the Maximum Security Prison in Muntinlupa. Board games, toiletries and beddings are welcome, too. Rock Ed likes remembering the inmates that society would rather forget.